11 April 2018: Inked beauty queen, journalist and primary school teacher Leanne Duck hopes to change the perception and stigma associated with tattoos, particularly in the classroom. The 25-year-old who currently holds the title of Miss Ink Australia, collected her second degree from the University of Canberra on Tuesday 10 April when she graduated with a Bachelor of Education. Even with a graduation gown and mortarboard, she was easy to spot in the crowd. Miss Duck has bright turquoise hair and eight unique neo-traditional tattoos which cover her arms, thighs, left calf and left shoulder blade. 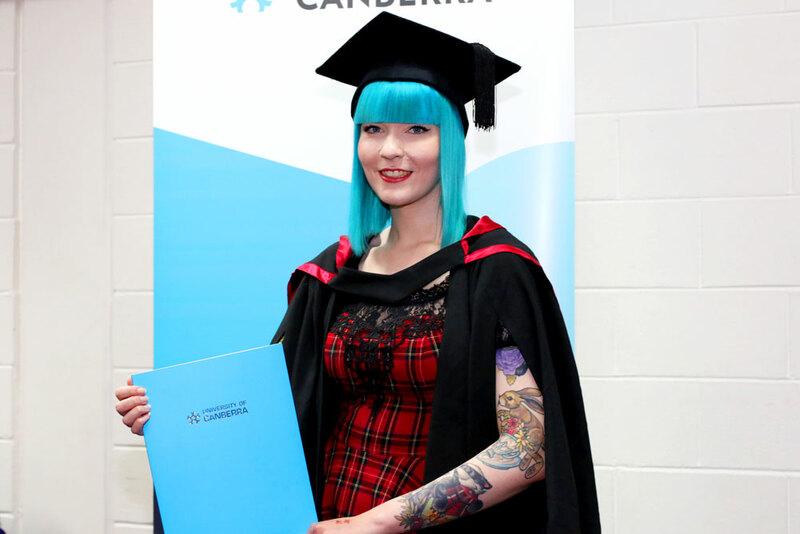 Miss Ink Australia Leanne Duck has collected her second degree from the University of Canberra. Photo: Vanessa Lam. Each tattoo holds an underlying meaning and Miss Duck enjoys sharing the stories behind them, saying her skin is “a canvas for self-expression”. Her tattoos include various woodland and sea creatures, a moth, teapot and red-headed woman with five sparrows on her crown. They are the work of Wagga Wagga-based tattoo artist Hayden Ramsey, where she is from, with Miss Duck estimating she has spent more than 40 hours in the chair and about $4,000 on the pastime. She is currently working as a relief teacher in ACT public schools and said when her students see her tattoos for the first time their reaction is one of “curiosity and wonderment”. Miss Duck graduated with a Bachelor of Journalism from the University in 2015 but returned to study teaching as she had family members that were influential educators and she was interested in “sculpting the next few generations of miniature humans”. “I think that I can help people realise teachers and public servants, for that matter, aren’t all generic cookie cutters because my appearance and personality isn’t typical for this profession,” she said. In addition, her writing skills are also being put to good use writing entertainment and lifestyle features for online and print magazines. Miss Duck said it’s difficult to compare her University graduation with being crowned last year’s Miss Ink Australia, saying both are “triumphant, personal achievements”. “I found the experience of winning Miss Ink very rewarding as a lot of hours were invested by myself and tattoo artist, Hayden Ramsey. To be recognised with a national title was surreal”, Miss Duck, who has also held the title of Miss Ink Canberra for the past two years, said. “My family has warmed up to my body art in recent years, especially after my pageantry successes. I’m mostly excited to solidify their pride even further graduating with my second degree from the University of Canberra,” she said.